Earlier in the year I was emailed about the Travelodge sale which included London so decided to book up so that we could use our Merlin passes on the London attractions. This year we’ve had lots of adventures using the passes, we’ve visited Chessington World of Adventures and made use of them on holiday in Weymouth. The thought of visiting London with Children can seem daunting however there are so many exciting things to see and explore, lots of them are free too! We stayed in the Travelodge Euston which was a bargain £45 for a family room and was really convenient to drop off our bags as soon as we arrived on Sunday morning and leave them there until just before our train home on Monday evening. We travelled with Virgin and also got lucky with tickets on the big seat sale meaning all 3 of us travelled to London and back for a total of £16, taking advantage of the fact Mini is still free until she’s 5. The only down side is that you can’t book seats for kids as they don’t pay and I did have her on my lap for a while, with not too much bottom wiggling! We took our Hudl and took advantage of the free Beam app on the train for her to watch some kids shows, which was pretty successful in keeping her quiet. Apart from when she speaks with her headphones on and practically shouts, which is pretty funny to watch. After dropping the bags off we headed to The Science Museum, which is a fantastic attraction and even better for free. Highlights were the garden in the basement for children to explore texture and do some water play, the space displays with the planets and astronauts and the interactive screens. The downside of the trip was that Mini got too enthralled in looking at the exhibits that she ended up standing in a big wet puddle! I just wanted the floor to swallow me up there and then! We had no spare clothes on us at all and were at the mercy of Kensington to find something. In the end we had to hop (or drip!!!) onto the tube for one stop and dived into the nearest Marks and Spencer for new leggings and pants! Due to our detour we didn’t get time to explore the Natural History Museum (another free Museum!) very much but we just had enough time to check out the Dinosaur exhibition, Mini was 100% convinced the animatronic T Rex was real! We will definitely plan to come back and spend more time here. Mommy don’t be scared this ones just old bones! For dinner we’d booked at Bella Italia just round from the museums, we used a Groupon voucher, I do love a bargain! All of the walking must’ve made us very hungry. Mini wolfed down breadsticks, garlic bread, most of her own whole pepperoni pizza and ice cream, with 2 glasses of juice. I was really impressed with the kids meals and would definitely eat there again as a family. I rewarded myself for dealing with #wetpantsgate with a rather scrummy cookie dough pudding and ice cream. By the time we’d made it back to the hotel we’d clocked up 15,000 steps for the day and collapsed into bed for a good night sleep in a really comfy bed. Monday morning we set off in search of Deliciously Ella’s cafe, The Mae Deli for breakfast as I’d followed the cafe for a while and wanted to try it out. We arrived a little early and ended up doing a few rounds of the block waiting for it to open. We were still a bit early but I think the poor waitress took pity on Mini peering through the window looking like she hadn’t eaten for weeks. I really enjoyed my porridge bowl which I topped with granola, coconut and maple syrup. I decided to try something new and went for the Matcha latte, which I’m sorry just tasted a bit like vomit. I’m clearly not accustomed to the superfood palette, absolutely nothing wrong with the drink just not to my liking. Mr Mack had avocado on toast and Mini picked beans on toast. This arrived on rye bread, no butter as it’s a vegan cafe and the beans were a mixture of beans in a thick sauce. It looked well presented but just not something I could convince her to eat, she had a nibble but really didn’t like the beans. En route to The Coca Cola London Eye, the first of our Merlin adventures of the day. As premium pass holders we were able to join the fast pass queue straight away and were in a pod within 15 minutes of arriving. For this we were grateful as the queue for standard tickets was getting pretty hefty! The trip was just the right amount of time for a 4 year old to have a good look but not get too bored. She enjoyed looking at Big Ben, which Grandad had told her all about, and seeing Buckingham Palace, although she wasn’t pleased she wasn’t allowed to go and visit the Queen! 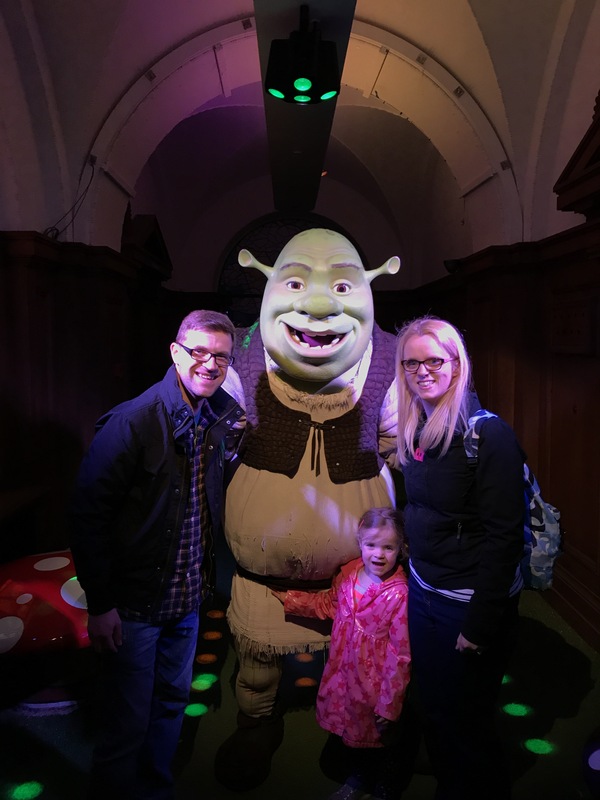 Next was a visit to Shrek Adventure, which was next door to the Eye and also included in our Merlin passes although we did pay £1 each to pre book a time slot. We weren’t really sure what to expect but all really enjoyed the experience. It’s done really well and groups are timed so you go through the experience in a group of around 30 people on an adventure to escape Rumpilstiltskin and get back home again. Goodness knows how the actors keep the enthusiasm repeating themselves every 20 minutes and keeping on the perma grins! The experience lasted about an hour and although we did enjoy it I think it would be a little overpriced if we had paid full price, but as it was included in the Merlin pass happy days! After the debacle of the healthy breakfast we gave in to the Golden Arches for lunch and it was dirty but goooood! Our final Merlin adventure of the day was the Sealife Centre London, which was also next door to Shrek. It was mega busy with a huge queue, which we got to skip thanks to the Merlin passes but even inside it was a little too busy for comfort and had to pretty much shuffle around the whole thing trying to fight to get a glimpse in the tanks. Our favourite parts were the very adorable Penguins and the newly opened Jellyfish exhibition. Mini particularly enjoyed the Jellyfish tank where she could change the colour of the tank, the poor things must have thought they were in a 90s disco the amount of times she pressed the buttons! The Penguins had just spotted it was feeding time! The pink button was the overall winner! We had time for a quick play on the play area in front of The Eye before heading back to Euston the catch our train, stopping on the way back to watch a few street performers which Mini was glued to and we had to practically drag her away from. The train journey home went well and was a chance for us all to relax a little, when it’s just the two of you, you don’t always realise how much walking you do getting around London. Mini was a trooper and never moaned about the distances we’d covered over both days, wa I was pleasantly surprised but also very thankful for! We really enjoyed the weekend and managed to pack so much in and can’t wait to come back again to explore some more of London. As a child London was also a special place of adventures to me as it’s where my Sister lived and I always remember my mom, brother and I coming to visit her on the train in the school holidays and getting to explore. I remember discovering the underground and being fascinated about how big the escalators are that seemed to go on underground forever and getting to visit all the floors in Hamleys. Therefore it was a really special weekend to show some of those places and share these experiences with my little family and I’m sure there will be many more trips to come. The journey home went smoothly and I changed Mini into her pyjamas on the train when I discovered a large spot on her leg which turned out to be the start of chicken Pox, but that’s another story, here’s just hoping she didn’t infect the whole of London on our travels…. I hope my post gives you lots of ideas of things to do in London with children, I’d love to hear about your ideas and top tips too.